Life on the Gravelly Road: Fall or Winter? Earlier this week we woke up to a dusting of snow outside. An excited little boy declared "Its winter today!! Will it still be winter tomorrow?" In celebration of this "in between" season we are in right now, we did this craft project. The same tree. Two different seasons. 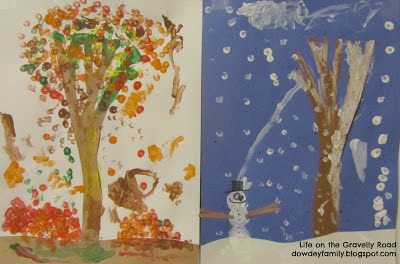 We had some great conversation about the differences between fall and winter, even that sometimes winter isn't so snowy. 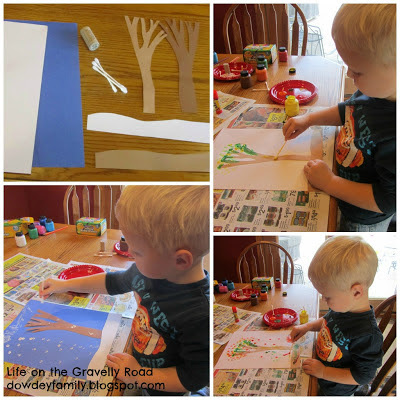 Before we started, I cut the trees and ground out of construction paper. My son glued them down. Then he started painting. He used mostly Q-tips, which he thought was fun once he got used to them (he kept wanting to use the other end after painting for a while, making a mess on his hands). He used a cork for the snowman. 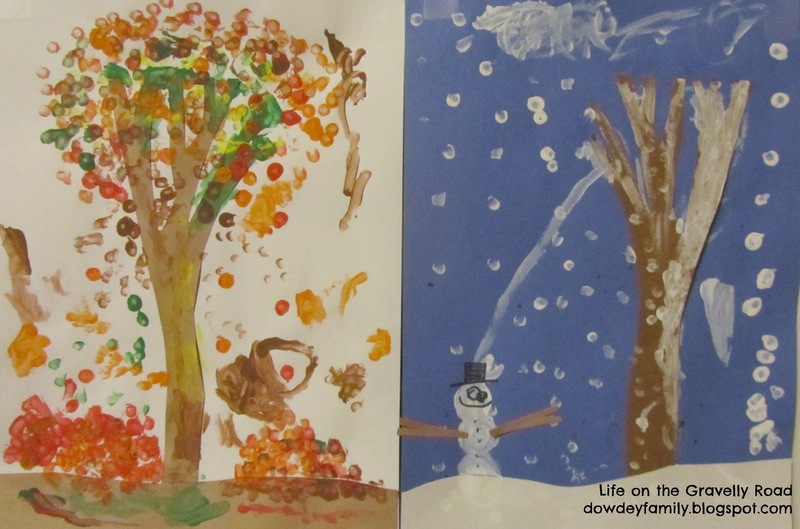 He decided the tree in the pictures was next to a house with lots of kids -- which is why there are piles of leaves in one picture and a snowman in the other :) I personally love the fact that a snowball/snowflake fell from the tree to hit the snowman in the head. So happy kinda fall, almost winter to you! I love this idea for this time of year! And it goes great with discussing the differences between the two seasons!